Eyes are the mirrors of the soul, and cats communicate a range of emotions through their eyes. The slow-blink is also known as the “kitty kiss” and signals affection. Return it through slow-blinking back! You may also find your cat staring at you. From a cat to a human it’s probably just interested in what you’re doing. 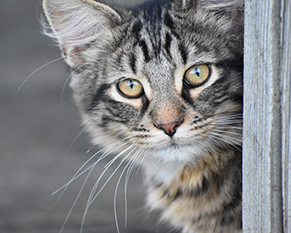 Cats don’t blink as often as we do, so we may perceive their stare as quite intense. If you meet a new cat, it’s good to know that meeting its eyes can seem like a challenge, or intimidating. You have a bigger chance of making friends if you look away. Once you know each other, meet its eyes briefly and slow blink to show your trust.